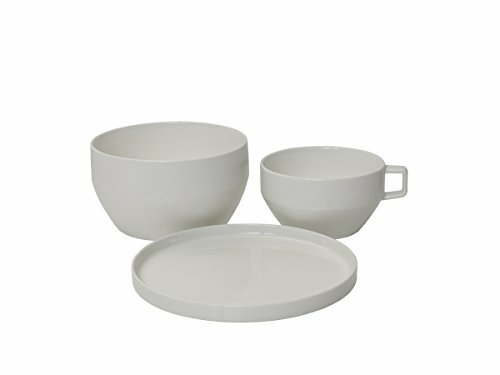 The Dine3 3-Piece Place Setting from Mikasa features stacking dinnerware that allows you to stack, store and sip; perfect for small spaces, dorm rooms or minimal lifestyles. Perfect for back to school, dorm rooms, space-saving, or a minimalist lifestyles, this set is a must have. Each piece nestles perfectly together to maximize room in your cabinets or countertops. The plate can act like a lid to store leftovers, or easily place the mug inside the bowl after your meal to save room. The over-sized mug is great for coffee but can be used for ice cream, fruit and more! Dishwasher and microwave safe. This set includes a 7.5-inch diameter dinner plate, 6-inch bowl and an oversized 13-ounce mug.